NOTE: The original recipe says this makes two 9-inch pizzas. We have a used a modification of this recipe several times in a 12-inch iron skillet and have finally decided that it’s too much dough, even for a 12-incher. When next we make this, we’ll reduce the flour from 4 cups to 3, and we’ll reduce the amounts of other ingredients accordingly. When we do, we’ll post the revised recipe. Nearly two years later (I was tempted to wait for the actual anniversary, but my better angels won out), here it is. I’ve used this recipe a couple of times now, and I think it’s ready for prime time. 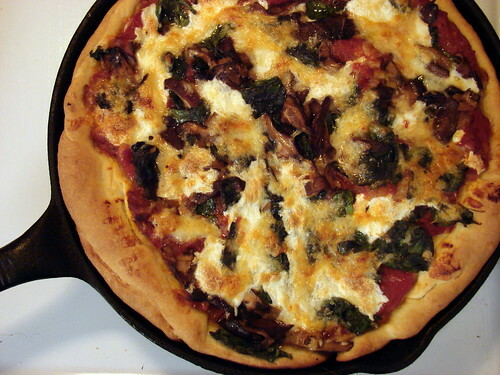 What I chose to do was to adapt my grilled or pizza-stone crust recipe and rework it with butter. The 2008 recipe also called for butter, and we like what it does to this kind of crust. 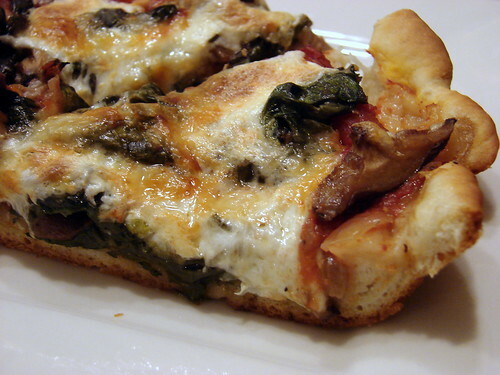 When you have a deep dish pizza, it’s very good to have a flakier crust. Otherwise, the pizza can become too leaden in texture. Combine flour, yeast, salt and sugar in bowl of standing mixer. Combine well, using the paddle attachment on low speed. 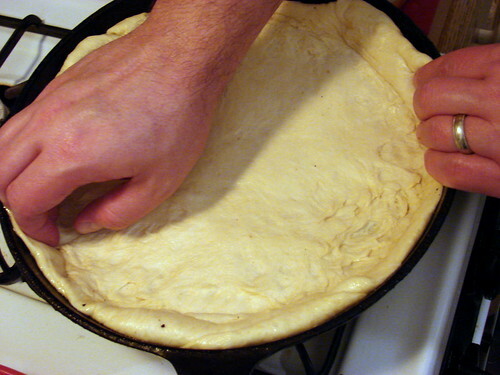 Knead, using a dough hook, until the dough pulls away from the sides of the bowl and crawls up the dough hook. Add 1 to 2 tablespoons water if dough is dry and not coming together. If dough is too wet, add 1 to 2 tablespoons flour. Baking instructions follow roughly what’s in the original post. Prepare your toppings. Preheat the oven to 400°F. Grease up the skillet, pat or roll your dough out, and line the skillet with dough. 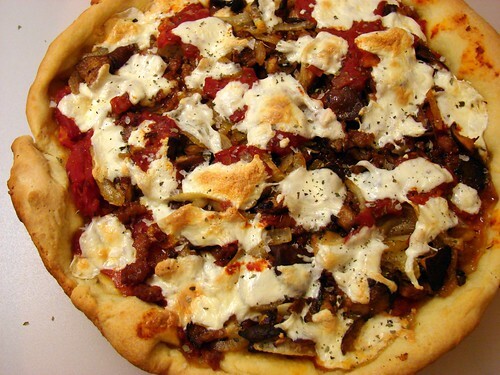 You build the pizza the way you want and bake until your toppings brown appropriately. This crust is versatile. We’ve used it with a veggie pie of spinach, mushrooms, tomato sauce and cheese, and we’ve also enjoyed a meaty sausage and onion pie. Thank you, thank you. Can’t wait to bust out the cast iron skillet and make it! 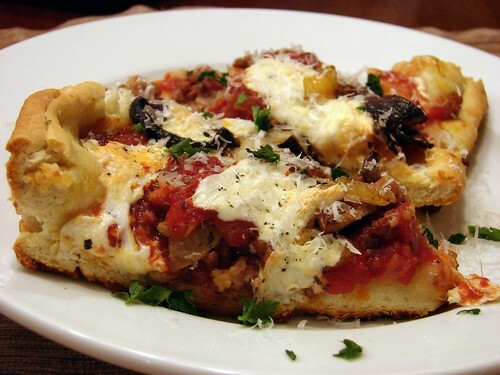 this will be made this weekend, using your dough recipe. gracias! yum! do you use a pizza sauce? It looks more like crushed tomatoes in the pic. Except lately, I’ve used port in place of dry red wine. It helps to cut the acidity of the tomatoes. Oh, I love the idea of the butter in the crust — cuz you’re right, a flakier crust is always better when it comes to deep dish. Looks like this dough is plenty easy to work with as well, which is always a plus. Will definitely file this away to give it a try! I like it a LOT. 🙂 I’m going to try it again over the weekend with a little less salt in the crust, and not pulling the dough all the way up the sides — we ended up with huge vertical crust. Tried this last night … AMAZING! I love it when you think you have a foolproof go-to recipe, and then you find something even better:) And it’s so easy! Just a few notes, though, to help anyone who’s thinking of trying it: We always buy active dry yeast, so that’s what we used. It worked great, but next time I’ll grab instant to see if it makes a difference. Also, the salt wasn’t overwhelming, but to compensate we didn’t salt the sautéed oyster mushrooms and leeks we put on the pizza. Next go round I’m going to cut the salt in half, especially since the butter we use is salted. Thanks for the great recipe! I made this pizza today – it was gorgeous. We used the Mike’s pizza sauce recipe and onions, red bell peppers and mushrooms for the toppings and I was so proud of myself! The stand-out was the crust, everyone commented on how good it was. Some changes that we made that I think really added to it – brushing the dough with butter (nothing beats butter!) and sprinkling with parmesan cheese before the sauce and toppings. I did halve the salt because of some of the comments but next time I’ll add a bit more. I definitely will try this again, soon – it was much tastier than delivery and it was a lot cheaper too.